Models & Tools is located in Shelby Township, Michigan, approximately 25 miles East of Detroit. There is no assembly tool too large for Models & Tools to design and build. Our facility measures over 115,000 square feet, containing a comprehensive program management department, a large design and engineering studio, climate controlled manufacturing space and five craned bays with up to twentyeight feet under crane hook. ... and the industry is recognizing us for it. 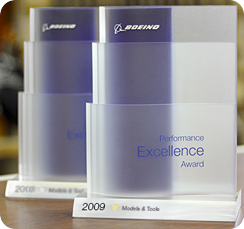 We're proud to be the recipient of the Silver and Gold Boeing Performance of Excellence Award. It is a tribute to our peoples' dedication and relentless pursuit of quality and excellence in tool design and manufacturing. At Models & Tools, we are committed to leading the industry in aerospace tooling. Having our customers acknowledge us for that is an award among itself.